At E3 this year, Nintendo announced a brand new game titled Daemon X Machina. The game involves you piloting giant customizable mechs—named "Aresenals"—and fighting even larger mechs, both on land and in the air. Daemon X Machina is developed by First Studio, a wholly-owned subsidiary of Marvelous. Aside from Daemon, they've worked on Fate/Extella: The Umbral Star and God Eater 3, making this their third fast-paced action game, albeit in a very different genre from the prior two. That having been said, while First Studio might be new to mech combat games, the producer behind Daemon X Machina is not. Kenichiro Tsukuda, who Nintendo are pushing as the visionary behind the game, has previously worked as producer on From Software's Armored Core games, known for their obsessive take on mech customization and combat. Notably, both co-directors have previously led development of Monster Hunter Stories, a fantastic 3DS role-playing game that handily out-Pokémonned Pokémon, and both are from an art and animation background, which helps when visualizing a game as stylish as this one. 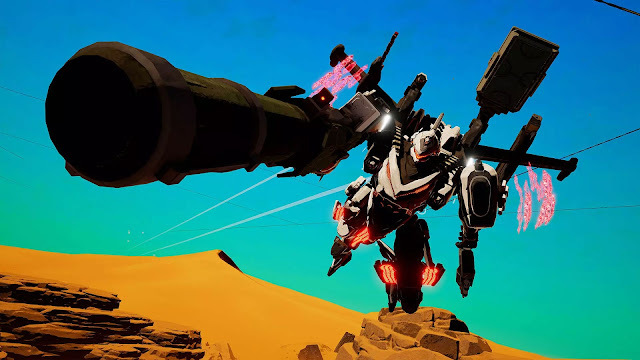 As previously stated, Kenichiro Tsukuda, who is the visionary behind Daemon X Machina, comes with a ton of mecha experience, having worked on a number of Amored Core games as producer, as well as on games like Lost Odyssey and Monster Hunter Stories. This is clearly a man that understands how to ship a complete game. Finally, we have Shoji Kawamori, the creator of Super Dimension Fortress Macross and its sequel Macross 7, and also the creator of Vision of Escaflowne. Beyond that, he has experience working on games, too, having served as a mechanical concept designer on a number of mech titles. The announcement of Daemon X Machina is a particularly momentous occasion because it suggests that, after years of allowing their bottom line to rely almost solely upon their not-so-tasteful Senran Kagura series, Marvelous might actually be attempting a return to making good games again. There was a time the studio was known for publishing cult hits like No More Heroes, Muramasa: The Demon Blade, and Half-Minute Hero; however, these days, we're lucky if we get a Story of Seasons game every couple of years in between the landslide of Senran Kagura projects. Luckily, it looks like things are changing. In addition Daemon X Machina, First Studio is also working on God Eater 3 for Bandai Namco, which would indicate that the studio is designed to work on multiple high-profile projects at once. In fact, Nintendo states in their press materials that Kenichiro Tsukuda is "overseeing production on a wide range of content as head of Digital Content Division Studio 1 at Marvelous Inc.," which means both this game and God Eater 3 are being developed under this department and that Tsukuda is its head. What's interesting about Daemon X Machina is that Nintendo of America are publishing the game in the States, which means that Nintendo see something in the product that they like. Hopefully, this support also incentivizes Marvelous to take on more similar projects in the future.